I chopped it off (it's quite short, oh my), squared the neck (thank you SO much for that idea Suzanne! ), took it in everywhere, added a matching pink ribbon, and now I have a new dress. I did keep the sleeves somewhat the same in order to preserve something from the original style of the dress. It was flowy and fun, but I think I collected more than a few funny looks at my pool. I looked might have looked a tad overdressed. But just a tad? A few last words on this project: a challenge for me. I had to go buy pins. It took my weak sewing skills to a new level, so I did learn something. But there were more than a few moments where I thought I was going to have to throw in the towel. My I-can-do-anything attitude disappeared more than once, and I was very humbled to look in the mirror with the mess of a dress on and say to myself, "What do I do now?" Glad this one is over. Can't wait to wear it to the Mother-Daughter book club Kanani Luau though! The luau was cut short by an extremely fast moving thunderstorm. One minute we were smiling for the picture, the next we were throwing ALL the food in the car and heading back to the house before the bottom dropped out. Once inside, conversation quickly moved to P90x, which two of us had started a week ago. Next thing we knew, Tony was on the TV and we were doing the Heisman alongside of him. It was hysterical. Tony would be proud to know that we turned our backs on all that good food in the picture to do a little workout. Of course we all hit the brownie plate right after this, though! See more fun thrift store finds over at Apron Thrift Girl. So funny :) Love the redo, it looks great on you. 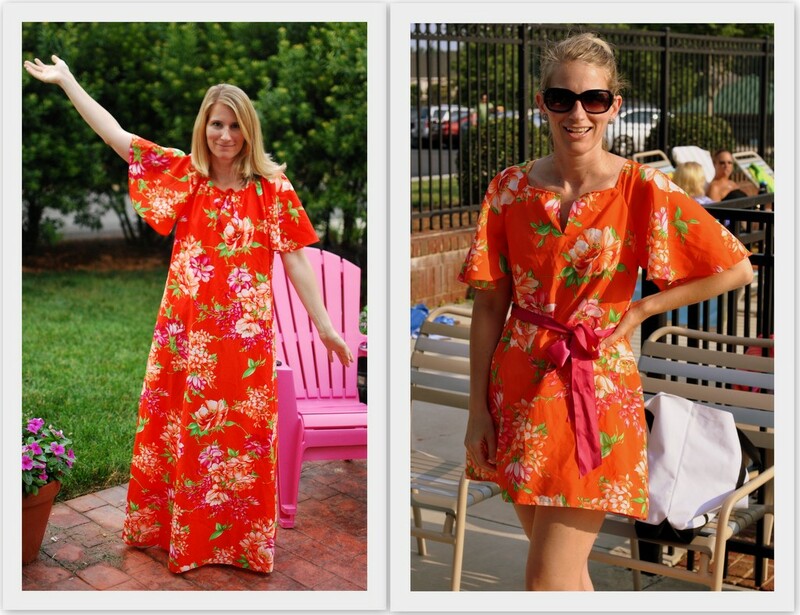 What a great redo...that muu muu never looked so good! Wow - you did a great job. Great job on the mumu! I Love it!! Fantastic job ;) you almost make me want to buy a sewing machine...almost! Love it! I always love clothing redesigns. Headed to my GW shortly. 50% day! So fabulous! I love the colors, the cut, the style . . . everything. So glad you linked this post up. Thank you!